SoundLabyrinth explores the relationship between sound and the body, and the sense of meaning or ‘sacredness’ that emerges from that relationship. 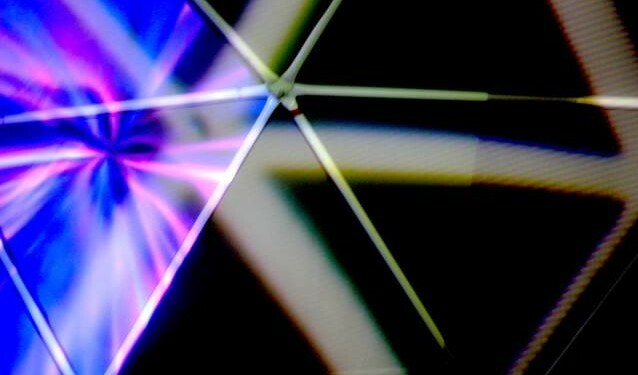 The work uses ambisonic sound and immersive video projection, set within a 6m diameter geodesic dome. Visitors will be able to explore a number of different sound worlds located within the space of the dome, comprised of material contributed by Indian and Australian poets Nazid Kimmie (Australia/South Africa), Jameela Nishat (India) and Alice Melike Ülgezer (Australia/Turkey), as well as field recordings and sound designs by Mark Pedersen. Utilising the immersive audio/visual infrastructure of SoundLabyrinth, Action A/V consists of three art objects, MOTION, SPEECH and VISION, which are designed to engage the perceiver both physically and mentally, and to represent that engagement through simultaneously showing the results of their physical and their mental interactions with it. The three objects overtly rely on the interaction and interpretation of the perceiver in order to become artworks. The work surrounds the perceiver, responding to subtle and intuitive interactions which entrance and fascinate. SoundLabrinth & Action A/V are being shown as part of the workshop Gesture, sound and place: an immersive exploration of body-mapped sonic territories in two audio/visual works: SoundLabyrinth & Action A/V. 10–11:30 am / 12–1:30 pm / 2–3:30 pm daily.